Sparkle and shine galore! 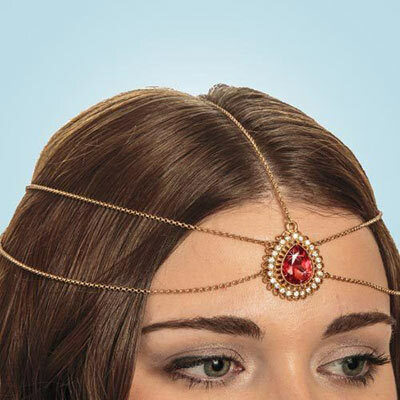 Stylish forehead Ruby Teardrop Headpiece shows off a teardrop-shaped faux ruby in the center, surrounded by clear rhinestones in a filigree setting. Gold-tone chains accent the sides with an elastic band in back for comfort. One size fits most. Center teardrop 1½"l. Hurry! Quantities are limited!